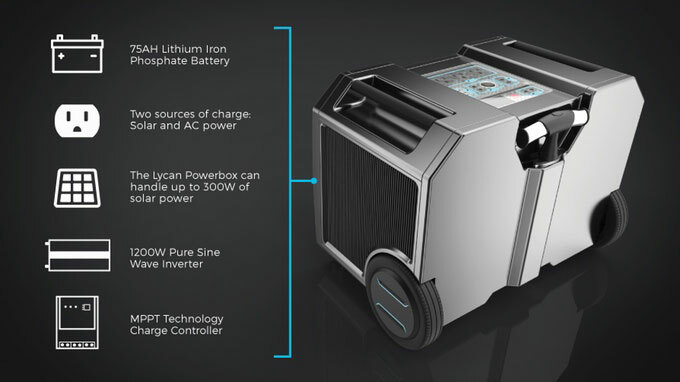 Meet the Lycan Powerbox: a solar generator that lets you power your appliances and gadgets during a power outage. It does not make a lot of noise and has a lightweight, rugged design. With swappable batteries, you can keep going no matter how long your electricity is out. The Powerbox can be charged using AC power as well. It is powerful enough to power a TV, laptop, camera, or refrigerator for a few hours. It has various 110/220V Ac and 5V USB outputs. More information is available here.